Arnott and Vederoff Ancestors - Beulah Dillon with her daughter and granddaughters. From left, Stephanie Arnott, Beulah, Alice Joyce Stevens Arnott, Lynell Arnott. July 1963 in Denver, Colorado. Beulah Dillon with her daughter and granddaughters. 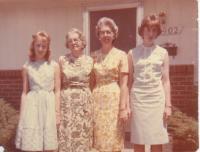 From left, Stephanie Arnott, Beulah, Alice Joyce Stevens Arnott, Lynell Arnott. July 1963 in Denver, Colorado.